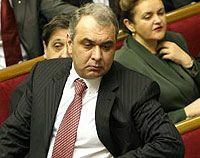 David Zhvania, member of parliament and witness on the criminal case brought on the fact of poisoning Ukrainian President Victor Yushchenko, has claimed again that presidential candidate Yushchenko was not poisoned in 2004, and the results of expertises on the case were falsified. D.Zhavia claimed this in an interview with BBC. “It was a mere food poisoning. The diagnose was determined yet on the first day, and every third person in the world often suffers from such poisonings. It is pancreatitis. On the day when he turned to doctors, all of them made this conclusion. I was present there. Later they decided that he must fly to Austria. I was opposed to that, as I was responsible for decisions, and I was one of the closest [to Yushchenko]. Because the proposed clinic had nothing in common with pancreatitis or anything similar. It was a cardiology center”, the lawmaker stressed. He asserts that the version of Yushchenko’s poisoning was though out in his electoral headquarters. “Namely the version of Yushchenko’s poisoning appeared not in his head, but was thought out by his HQ members. And they made that statement. The statement was issued by Mr. Zinchenko, who was commissioned by the headquarters. At first, they said that it was a biological weapon, a chemical one. Does not matter – it was an emotional action”, D.Zhavia said. According to the MP, he objected to these statements. “I, as one of HQ chiefs, was against that, because I said that we will become hostages of our position, if we will claim about the poisoning. I said that, in fact, it will hit us, because we, first of all, will threaten the population, which will behave inadequately. I was not heard. Then I asked Victor Yushchenko not to confirm it to a certain moment”, D.Zhavnia said. Asked about analyses of the poisoning, he said that all the analyses were absolutely counterfeited. At the same time, the lawmaker stressed that his statement about the absence of the fact of poisoning is his civil position and a “firm belief”. “Because this case is the biggest fear of Yushchenko. He is afraid of that most of all. There is no more prosecutor’s office, the Party of Regions and administration representatives rule the country. In fact, they began to blackmail the President. At present, he acts killing the achievements of previous years because he is afraid of it [the revelation]”, D.Zhvania claims. As UNIAN reported earlier, Victor Yushchenko was poisoned with dioxin during the presidential electoral campaign in 2004. The investigation into the case has not finished as yet.